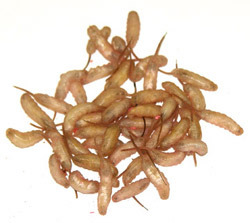 This is a very popular Winter Bait that is not that easy to find. We happen to have a few good diggers and always have a good supply most of the winter. This bait gets it name from the long tail that it has. This bait is available is November to March. When available in the Spring this bait is one of the best for early panfish. When you get your order take out of shipping container and put in refrigerator at 36° to 42°. Because Mousees are a wild caught product and because some years they are plentiful and other years they are not. The Winter of 2016/2017 is a year with the Mousees not being plentiful and will only be sold in the 24 count in order to try and spread what few Mousees are available to more customers.